Parc Astérix is the 2nd largest theme park in France. 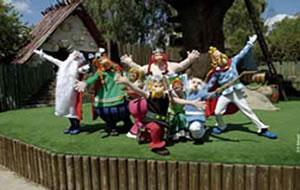 Parc Astérix is a superb mix of fun-tastic shows and wild rides dedicated to Gaulish good humor. Fun for all the family, this Gaulish of theme parks offers you more than 30 attractions in the open air to live out adventures specially designed to satisfy all tastes. Parc Astérix is only open between April and November.